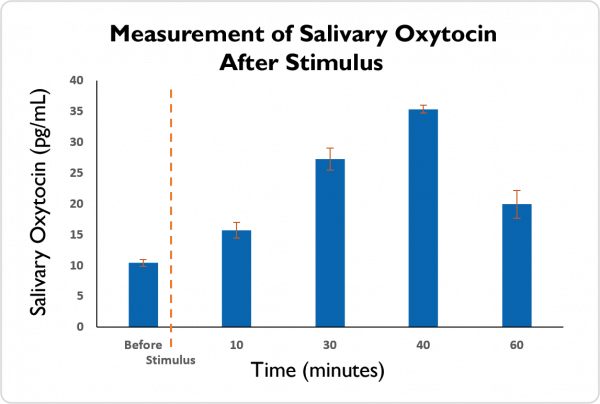 Our Partner Salimetrics LLC announced this week the launch of a Salivary Oxytocin Assay which we are pleased to report will be made available from Stratech Scientific here in Sydney Australia. Oxytocin is part of a highly complex psychological and biological system that underpins many of the archetypal human emotions and guides social interactions. Oxytocin exists as a cyclic active molecule and also in a pool with disulfides linked to other proteins. By using monoclonal antibody depletion experiments, Salimetrics was able to show that the antibody employed in the assay recognizes cyclic oxytocin and may also detect forms when linked to other proteins. Often called “the love hormone,” Oxytocin is a powerful neurotransmitter that regulates social interaction, pair bonding, milk release, uterine contractions and sexual reproduction. Research in numerous scientific fields have investigated oxytocin’s effects in fields such as maternal-infant bonding, empathy, generosity, racism, and pair bonding. Oxytocin is part of a highly complex psychological and biological system that underpins many of the archetypal human emotions and guides social interactions.